Artificial Snowberry Real Touch Foliage Spray: exquisitely life like designed faux Spray, bring a bit of the outdoors in! 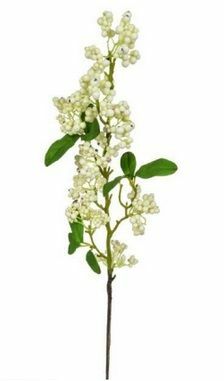 Design highlights: this fake Snowberry Real Touch Foliage Spray is great to add a bit 'country life' to your wedding, home or business! Our lovely Artificial Snowberry Real Touch Foliage Spray is a great replica of the real thing. A great alternative to real flowers. Perfect if you can't have a live plant, but still want to enjoy/appreciate the beauty and elegance of nature. Christmas Delivery 2018 Information: Last recommended order date for a Christmas 2018 delivery on tree/larger items sent with a Courier (subject to stock) is midday Thursday 20th December 2018 for delivery, needing a signature, on Friday the 21st. For any 'last minute' Courier orders we will still be shipping out on the Friday 21st morning (till midday) for delivery Monday 24th December but the earlier on Friday 21st the order is placed the more chance of a Monday the 24th December 2018 delivery. For smaller items sent in the post or Standard delivery (subject to stock) we recommend the last order date of 10.00am Tuesday 18th December, although for a small extra charge we can upgrade to a Next Working Day courier service and the Courier dates above will apply (you MUST select this method during the checkout process in the basket page). Please contact us if unsure. Please make sure someone is in to accept and sign for the delivery!